Sound like anyone you know? These are just a few of the more prominent schmucks. In her new audiobook, Dr. Jody Foster explains the entire spectrum of schmucks and how they can decrease productivity and generally make everyone else unhappy. After delineating the various types of schmucks, she looks at personality traits and explains how interactions among coworkers can become maladaptive, leading to workplace disasters. She helps listeners understand the schmuck as a person, figure out how to help him or her, and effect a positive solution. Dr. Foster also helps listeners understand the most difficult thing of all: Sometimes you are the schmuck. 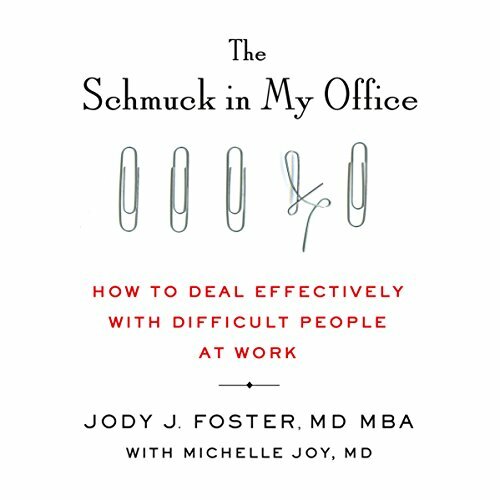 Let Dr. Jody Foster show you how to help the schmuck, know if you are the schmuck, and make your workplace a happy and productive one. When someone who doesn’t know all those medical terms reads this book, will think that is more for someone who studied psychology. When the narrator had to made her point on some terms, she would be loud, too loud for me. This audible book, is not listener friendly outside of the app. Trying to listen to it at work on the audible website is such a hassle because you cannot reliably rewind it if you need to. instead it would go back to the beginning. The chapters cannot be chosen either, you need to fast forward in 30 sec increments. WHY? Shmucks!? You might be the schmuck! Would you listen to The Schmuck in My Office again? Why? It is a very easy listen and gives insight to personalities in the workplace. It gives both high level psychology & lower level psychology. It can be a simple how too. It can also bring to light things about oneself and others we might not see or are not ready to face in a workplace setting. Worth a listen or purchase. What was one of the most memorable moments of The Schmuck in My Office? Not one memorable moment but I like how the author seeks to thread the need to really work with others to resolve and reconcile. It shows the need to regard others not just fire them. I was hoping for more helpful responses to how to address various situations. However, the author seems a tad mean spirited and mocks people, so I didn't like listening to it. didn't want it to corrupt my own heart so stopped listening after a chapter and a half. didn't hear real solutions to how to address situations, which is more of what I was looking for. This book does go into detail about the psychological issues with "schmucks" and how to understand them. I felt it went into way to much detail , with a lot of studies being referenced. Detail is good , but it did drag on. Which is my main issue with this book.